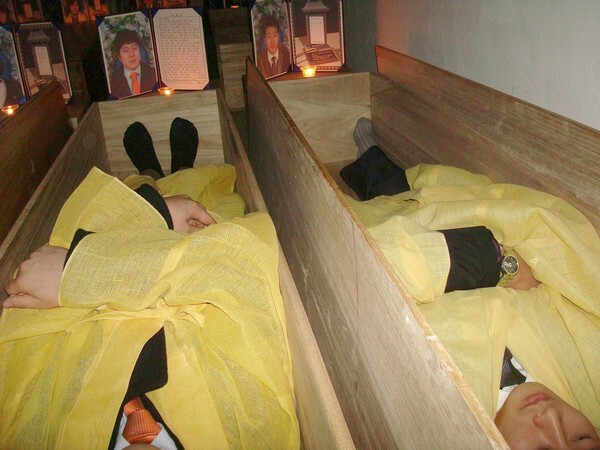 For $25 a client, the Coffin Academy in Daejeon, South Korea, will help you experience what it’s like to be a corpse, including penning your own epitaph, writing final letters to loved ones and attending your own funeral — supine in the darkness of a closed coffin. In a country with an exorbitant suicide rate, these kinds of death seminars are viewed as a means to “appreciate life by simulating death” and are particularly popular with large firms hoping to boost worker productivity. But they’ve also been criticized as “how-to manuals” for suicide, or apt to lead to suicide ideation–the opposite of the intended effect. Interestingly, advocates aren’t only selling it as an effective vehicle for life reassessment and renewal, but as a morbid “scared straight” encounter. That’s right — don’t kill yourself, because it’s dark and scary in a confining coffin, which your employer has just required you to experience. Proponents of unsavory future lives may argue otherwise, but I’m pretty sure death is a cure for claustrophobia. Check out the full article linked above. While unfortunately slim on follow-up — just how productive, happy, readjusted or suicidal anyway are the participants the next week, month or year? — it does provide a good overview of the seminar and descriptions of the emotional impact on participants along the way. Just a teaser… many of them are freaked the heck out. 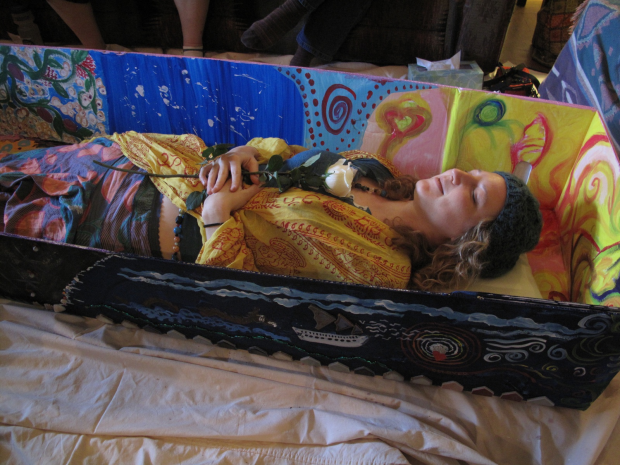 Posted by Meg Holle in Death + Popular Culture, Defying Death, Suicide and tagged death meditation, seminars. Bookmark the permalink.